Wah! So many photos of the chef with local celebrities. Chef Steven Chua, who helms the kitchen, must have garnered support from these artistes for famed Lobster Porridge and Prawn Paste Chicken. The Chicken King is a different story all together. The menu consists of predominantly fried food. Fried chicken, fried squid, fried rice, fried potatoes (I mean fries). Not for the health conscious or those nursing a sore throat. 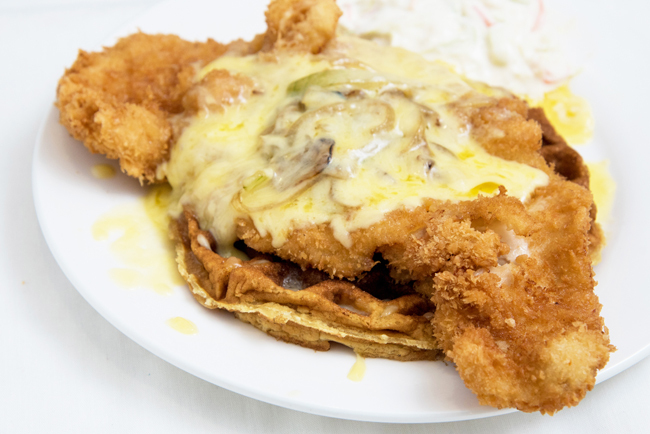 Dishes recommended to us include the Steven Chicken (4 pcs for $5/ 6 pcs for $7.50), Steven Popcorn Chicken ($5) and Buttermilk Chicken Waffle ($12). Being a popular dish at Orchid Live Seafood Restaurant, the Steven Chicken (4 pcs for $5/ 6 pcs for $7.50) was named after its creator. 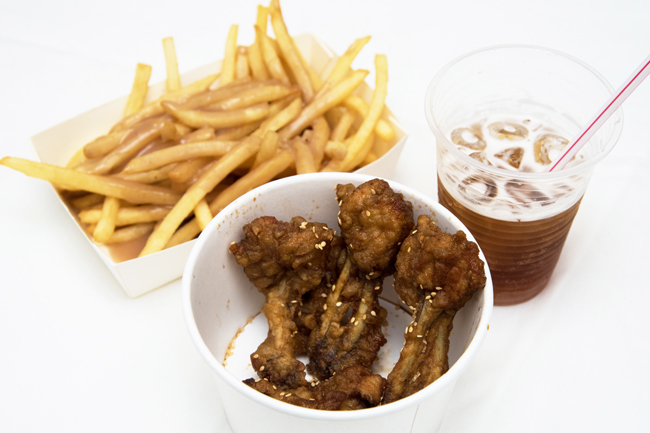 Deeply infused and marinated, the Steven Chicken was somewhat addictive with a slight saltish soy taste like a snack. On the other hand, we wished that the chicken could be meatier, slightly shrivelled, little flesh on the bones. Each set of a main with side comes with a free drink of your choice. Salted Egg or Orh Nee (yam) sauce were available at an additional $2 for the Shoe String Fries ($3). The yam sauce wasn’t too yammy (I mean yummy), a tad too sweet for our liking. Fries were also regrettably soft and soggy. 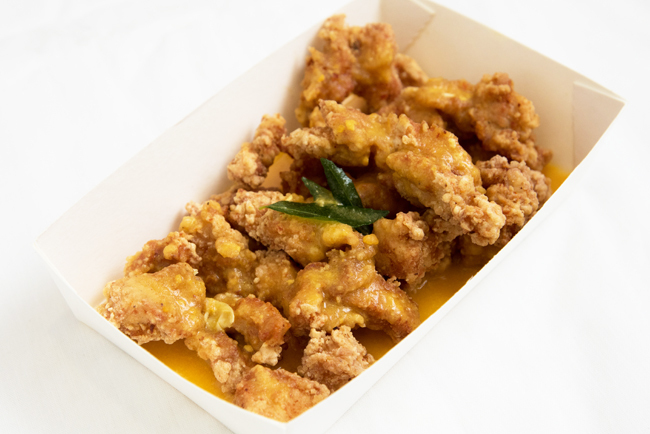 The pieces Salted Egg Popcorn Chicken ($5) reminded us of popcorn chicken at another fast-food restaurant – small, bite-sized and convenient to munch on. We loved the salted egg sauce drizzled on the chicken, which reminded us of tze char style with a hint of laksa leaves. The fried chicken, on the other hand, also suffered the same fate of being dry. There is still room for improvement for the food presentation if they would like to appeal to the younger and hipper customer base. 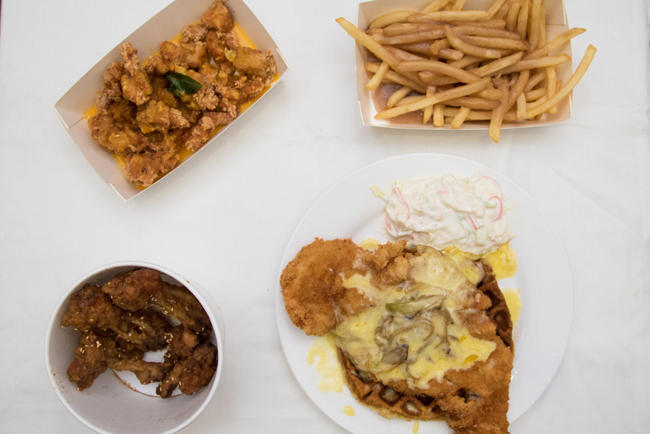 Fried chicken served in takeaway boxes, Buttermilk Chicken Waffle ($12) served on plastic plates similar to that in food courts is likely not to appeal to them. The shimmering golden brown, crispy fried breaded crust chicken with melted cheese and caramelised onions looked promising. However, the fried chicken was dry (again) and waffle soft and limp. 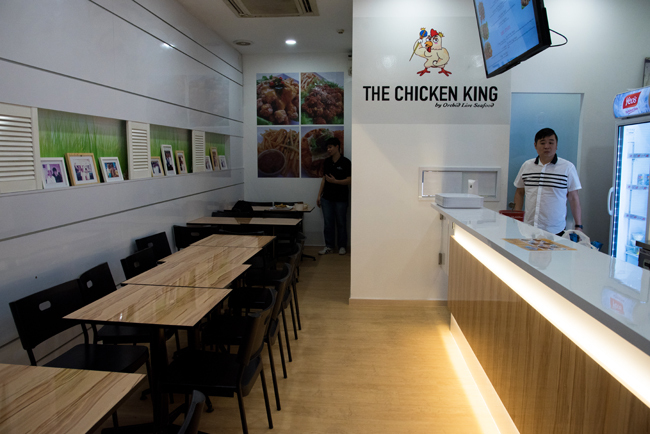 The Chicken King would probably face some competition from a fast food restaurant in the same block, since they offer a chicken-centric menu. Translating processes from a seafood restaurant to a Western concept would require some further refinement. If you need to, the Steven Chicken would be the safest bet. * Written by Daniel’s Food Diary Café Correspondent Nicholas Tan. Follow him on Instagram for news on latest café openings. Thanks for the review though, wouldn’t know that I have a be option near my workplace! The Steven chicken tastes so good and it’s so addictive. I also like the salted egg popcorn. What a good infusion. Personally I think it’s valued for money. Thanks for your review. We have since started using chicken thigh instead of chicken breast to solve the “dryness issue” and customers feedback has been good ever since. We also continue to improve and hope to welcome you again. WA the chicken sibei tok gong. I buy for my family they all like sia. Waldo the orh née fries also sibei nice eat alr my mouth won’t stop sibei shirk. The Steven’s chicken is a must try for all chicken lovers. Happened to be at tpy this afternoon so decided to give it a try since i have been hearing positive feedbacks from my friends. And to be honest it is one of the best/the best chicken I ever had! The taste was just nice for Singaporean liking. Will definitely be going back there again even though I’m staying in Jurong! Hi there, I’ve looked thru and the menu consists of mainly chicken, although I would love to try it, could I know if you guys are halal certified or planning to get one? I just went to tried the steven ckn & the salted egg popcorn ckn, its awesome. I cant wait to try out the others! So yummylicious that i am craving for it everynow n then! 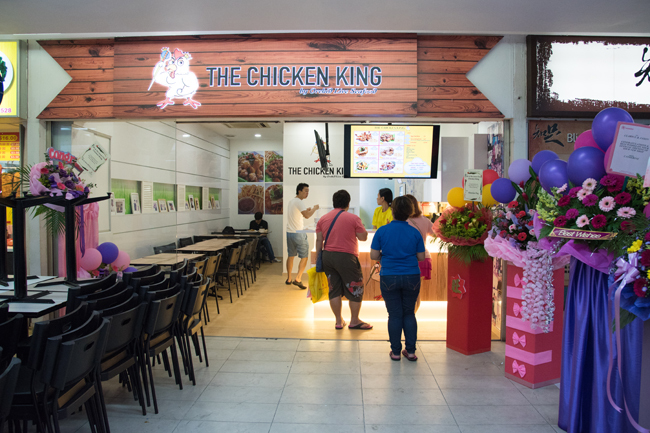 Suddenly got a group of people commenting October 27 claiming the food to be so fantastic, I’m starting to wonder whether people behind Chicken King are doing the praising? Lol. Anyway if the food is good and continue to maintain standard, people will start patronising. Haha ya suddenly so many comment on the same day, anyway will go there and have a try one day. Ya, I feel suddenly there are so many comments in just 1-2 days and all are praising how delicious the food is, I can’t help but feel that it is the team / one person behind “Chicken King” to “rectify” the “not-so-good” review. I feel it is unethical to do that. One should respect the views of food bloggers especially when they are “not paid” to write the reviews. To win over the customers, they should put focus on their food quality instead of doing all these little tricks. The wings are a definite must-try. Pretty value for money as a whole I would say. Recent comments seems really suspicious. 1. The lady who our orders gives us the feeling that we owe her something when taking our order. She probably had a bad and busy day. 2. We were served food first and then the staff went to chit chat with her friends for a good 30 seconds before she deliver the utensils to us. 1. Many of the selection were out of stock namely waffle and certain drinks. We were there at around 2-3pm on a weekend afternoon. 2. 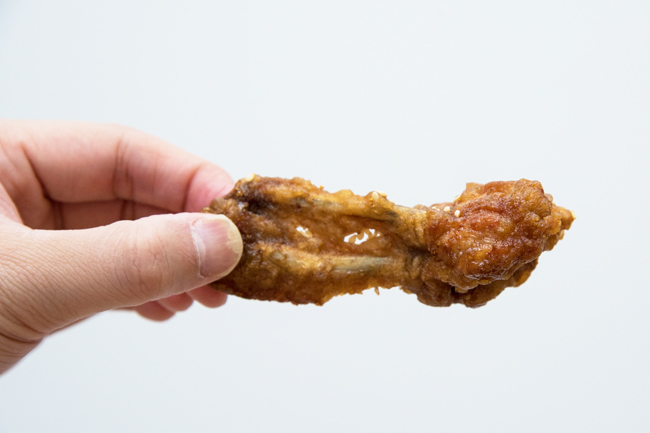 Steven chicken’s taste resemble a soy version of Korea fried chicken. Price vs Quality Ratio, this dish is kind of pricey in my opinion. 3. Salted egg popcorn chicken + fried rice. The salted egg gravy tasted refreshing at first with a hint of the eggy smell. However, subsequent taste feels like they have over thickened the salted egg gravy with flour and water. The fried rice were evenly fried and puffy. Is this worth a visit and price? IMO I think you need to wait a while for them to stabilize as there are quite a few issues for them to iron up. Portioning may need to be review as well as I think I can find alternative from various fried chicken competitors at a similar/cheaper rate. Overall, Services were not up to expectation and the food:portioning were not worth the price IMO. I had my meal on 2nd nov.2015 at 6+ p.m., at toa payoh. container. The girl at the shop has attitute problem and unfriendly look, I think she is not fit to be in the service industry. Recently when there on a Sunday to try it out. There wasn’t any menu and it is just paper for us to see. Fine. Me and my friends we ordered 1 salted egg chicken, 1 Steven chicken and 1 prawn paste chicken and they have this opening set which is $7.50 to go with the rice. So we ordered 3 sides, 1 fried rice and 2 fries. The lady over the counter wasn’t friendly. Like in some places we were thinking of what to eat, most of the time they will give us suggestions and all. Yes it is our fault to be wasting time over the counter to think what to have, but she just give you the stare like as if we are not paying for the food. Then once everything was done we went back to our seat and waited for the food. The lady came over and say she charged us $2 less. So we ask her what is it about, her explanation wasn’t clear and she just ask us to pass her $2 will do. For the food wise, the fries was too soggy, salted and it’s not being cook well. It’s like they just fried everuthing half cook and just chuck all the fries into the bowl and all. And there’s a very strong oil smell when you start eating it. As for the fried rice, is just scramble egg with soy sauce and cook over it. When it served, it was not even hot or warm. Plainly cold. As for the chicken, the Steven chicken is worth the money, the salted egg pop corn chicken is like the salted egg sauce is like from the prepack and put in the slow cooker and just cook in and making it hot at the same time. And the worse was, the salted egg the sauce there’s still some starchy stuff on it. For the prawn paste chicken, it’s not something fantastic. Don’t have the prawn paste taste, I only taste the flour that’s it. We were being served by this young guy. His service was good. And at that time we eat was around 6 plus going 7pm? And the shop is closed at 8.30pm. So me and my friends were seated inside. Not even 7pm, the counter girl start to tell the young man that they should start packing up and close since there isn’t any customer, and the guy told her it is not even 7pm I think we should not do that. So the girl didn’t bother start stacking up the chair outside like to us is indirectly hinting us to finish our food fast. So overall, I will not go back for the second time because it is not worth the value with the standard of food I get and standard of service I received. NOT recommended at all. Limited choices of food and drinks. Chicken was too dry and after eating a few bites you’ll just get sick of the taste. The salted-egg sauce tastes stauchy? Unpleasant. Food was not consistent– shoestring fries were once used, but when I was there, it was straight cut fries. Ugh shouldn’t have even tried it; the fries were soggy and very, very dry. Have to keep sipping drinks whenever I were to eat either of the chicken or fries. Presentation wise, it was bad. It’s like they don’t even bother to present the food so that at least they’ll look decent. Lol.